This drawing by Jean-Louis Forain, published on the front page of a Parisian newspaper in 1920, rallied support for the original Droit De Suite. 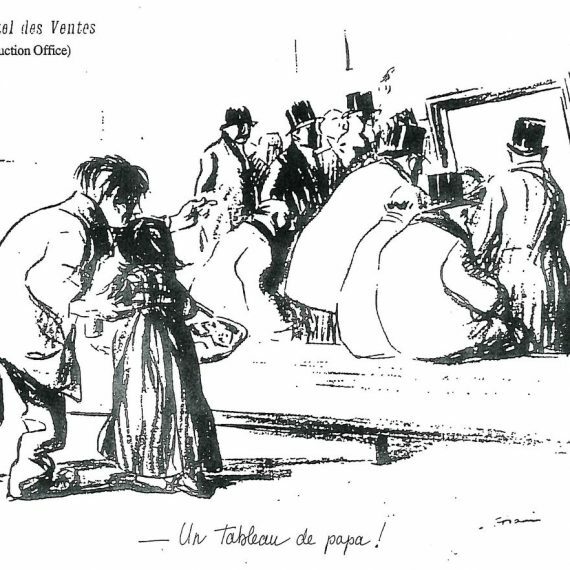 The drawing shows an impoverished beggar and his child outside an auction house where the father’s painting is being sold for large sums. Irish artists are experiencing serious and ongoing difficulties in collecting the royalties to which they are entitled. The Directive which introduced the right across the European Union in 2006 was improperly transposed into Irish law via a statutory instrument rather than legislation. The weak regulations have resulted in a low level of compliance from the art market profession, in particular from galleries and art dealers, many of whom have largely ignored or avoided the right. The regulations do not provide an effective mechanism for the collection of royalties due to artists and their heirs. This has led to a continuing and unacceptable loss of income to artists. The EU Directive gave member states a considerable amount of freedom in how they implemented certain elements of the Directive. Member states could for example, choose the threshold at which a royalty was due, they could set the royalty % rate, and, most importantly, dictate how the right would be managed. Unfortunately, instead of introducing the Resale Right through legislation, Ireland missed the deadline and rushed the implementation through a statutory instrument. The various options in the EU Directive which would have made the Resale Right more meaningful to artists could only be adopted through legislation. This has had a significantly negative impact on the benefit of the resale right for Irish artists. The resale right should be fully implemented through primary legislation to benefit artists and their heirs. The minimum threshold of the resale to which the right applies should be lowered from €3,000 to €1,000. That legislation should place an obligation on both the seller and intermediary to share the responsibility of payment. * Compulsory collective management is the method by which the right was implemented in most EU States. This means that the royalty is collected at the source of sale and is distributed by a dedicated artists collecting society on behalf of all entitled artists. IVARO met with Sean Sherlock, Minister of State, Department of Enterprise, Jobs and Innovation on 22 March 2012. IVARO used this meeting to highlight the ongoing difficulties which artists and their representatives are experiencing with the Artists Resale Right Regulations. These difficulties are outlined in IVARO’s numerous submissions to the Government. Our most recent submission was made in June 2012 to the Copyright Review Committee which was established by Minister Richard Bruton. A legislative issue which affects our members relates to European Communities (Artist’s Resale Right) Regulations 2006 to give effect in Ireland to Council Directive No. 2001/84/EC. The improper transposition of this Directive into Irish law requires urgent attention. IVARO is mandated to collect the artist’s resale right on behalf of its members in Ireland. It is also mandated through its reciprocal rights agreements to collect the royalty on behalf of the members of foreign societies who are entitled to this royalty in Ireland. Article 3 of the Directive provides that works sold at €3,000 and above are subject to this royalty. Member States are allowed to impose a lower threshold for eligible works. Many Member States have a threshold of €1000. This option was taken up by the UK, our nearest neighbour and Europe’s largest art market. Ireland implemented the right at the maximum threshold of €3000 which has resulted in a relatively small number of artists benefitting from the right. IVARO collected resale royalties on behalf of 54 artists in 2010. In Ireland nearly 98% of art sells at auction for less than €50,000 and 50% sells for less than €1,000.A threshold of €1,000 will benefit a much wider constituency of artists and be a further stimulus for artists to create new work. This is also important for foreign artists whose works resell in Ireland due to the fact that the threshold is much lower in many countries. In addition to this, under the Directive the minimum rate applicable to the portion of the sale price up to €50,000 is 4%, which is the rate Ireland implemented. Member States are given the option of applying a rate of 5%. This is a preferable rate for Ireland, bearing in mind that most Irish art sales do not exceed €50,000. Increasing the lower band rate will provide proportionally higher royalties to less well-established artists. The collection of this royalty has proven problematic for artists and for IVARO who collects this royalty on behalf of its members. As it stands, artists have to be aware of any of their works which sell over the threshold. They then must seek information on the seller from the art market professional for that specific sale. The art market professional has 90 days in which to respond to this request. The artist, or in many cases IVARO, must then apply to the seller for payment of the royalty. It is a laborious, time-consuming and difficult task, especially for individual artists. This system could be streamlined with the introduction of compulsory collective management which would include reporting of qualifying sales. Where possible, the collection agency should be the national authors’ society, to make the most out of cost savings from economies of scale. To meet the mandatory requirement of the Directive that Droit de Suite is administered on a reciprocal basis between all Member States, all collection societies should belong to a network or umbrella organisation to enable reciprocal exchanges of rights and funds for artists internationally at a low cost through the use of common administrative systems. If compulsory collective management was introduced and a collecting society was appointed this would mean that resale royalties would be automatically collected on behalf of all rights holders, whether or not they are members of the collecting society. Art Market Professionals would be required to supply the collecting society with data after each sale. The collecting society could then collect the royalty from the seller and distribute the proceeds to the rights holder without delay. Royalties for foreign artists whose work is resold in Ireland would also automatically be collected ensuring that Ireland complies with it’s obligation to “ensure that amounts intended for authors who are nationals of other Member States are in fact collected and distributed.” – Article 28, EU Directive 2001/84/EC. An Investor’s Guide to the Art Market by Dr. Clare McAndrew. Published by Liffey Press. Implementing Droit de Suite (artists’ resale right) in England. Arts Council of England Report. Dr. Claire McAndrew & Lorna Dallas-Conte, 2002.